Are you concerned about surgery with an aging dog? Does your dog have any medical conditions that could make him a risk for surgery? Are you interested in a more conservative approach for your dog’s recovery? Are you concerned about financing the cost of surgery? 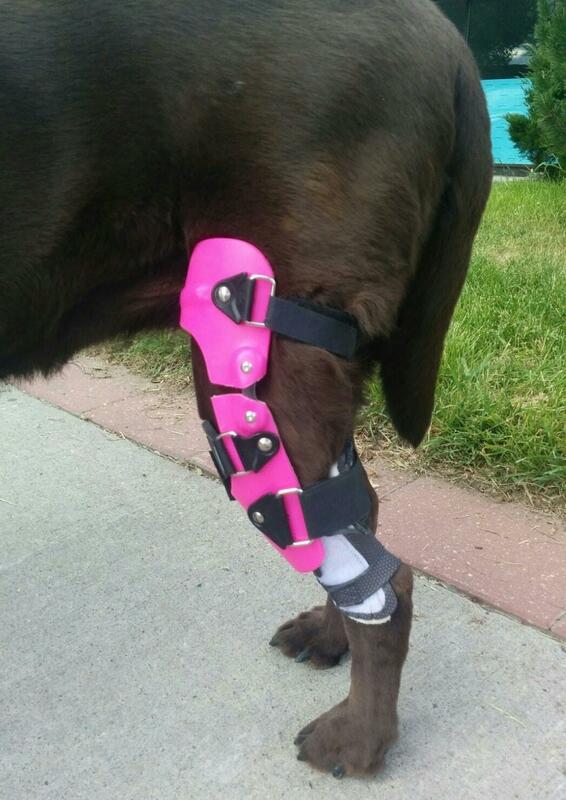 A brace is a successful alternative when surgery isn’t an option, helping your dog recover well and live a pain-free, functional, and happy life. Our braces are truly custom made and we take pride in our work, ensuring excellent quality for each and every brace we do. The preparation for the brace is done in the comfort of our clinic without anesthetic in a stress-free environment for your pet. We have been custom fitting braces since 2014 and the experience we have is evident through the efficient and precise measurement/casting process and effectiveness of the final product. Knee (Stifle) Brace – CCL tear (Cranial Cruciate Ligament), Medial and Lateral instability, Contracture and Fracture management, Arthrodesis, and Varus/Valgus Deformities. Ankle (Tarsus/Hock) Brace – Achilles Tendon injury, Gastrocnemius muscle injury, or any condition that creates knuckling and collapsing or hyperextension of the hock. Elbow Brace – Osteo Arthritis, Degenerative Joint Disease, Dysplasia, or any condition that creates limping, collapsing, decreased weight bearing, or increased instability of the elbow joints. Wrist (Carpal) Brace – Hyperextended Carpus injury, Brachial Plexus injury, or any condition that creates knuckling and collapsing or hyperextension of the carpus.